Sorry - just posted a duplicate thread. Use this one folks! Felton, GREAT to see you back in shape!!! Thought I get an early marker in as well. Completely dead now and not even close, 28sec behind. Unfortunately FS I isn‘t at the top spot anymore but at least we represent 50% of all floated boats A very good start for Free Spirits in participation so far, well done evryone! First two reps were pretty much according to plan,but I was able to go much quicker than planned on the short reps (which of course means I wasn‘t fast enough on the long reps ). congrats all early finishers ! Yes.Tried to match your time and HD'd so no chance of catching Claudius. Great rowing . Well, couldn't resist joining the fun any longer. Great efforts all round! Tried to hold to the 2km +logic noted earlier, and it felt horrible. Wanted to try to get close to 18 minutes, and am pretty pleased with the result. Everything I had today for an inspirational lady. Guy, what is your current 2k? Wow, thanks for the kind words all ! Strangely enough, the past week or so has felt a bit patchy - I've put in some rows that I'm definitely happy with (e.g. the CTC), but I've been feeling a bit off the boil on other days so your positive comments are most welcomed ! I've never thought of myself as someone who could provide motivation, in fact I take plenty of motivation from everyone else here. Plugging away, chipping away at e.g. CTC scores by a few seconds at a time, it's really inspirational stuff. As for my current 2k - difficult to say. The last true eyeballs out 2k I did was the Welsh IRC almost a year ago & that still stands as my PB (6:39.7). 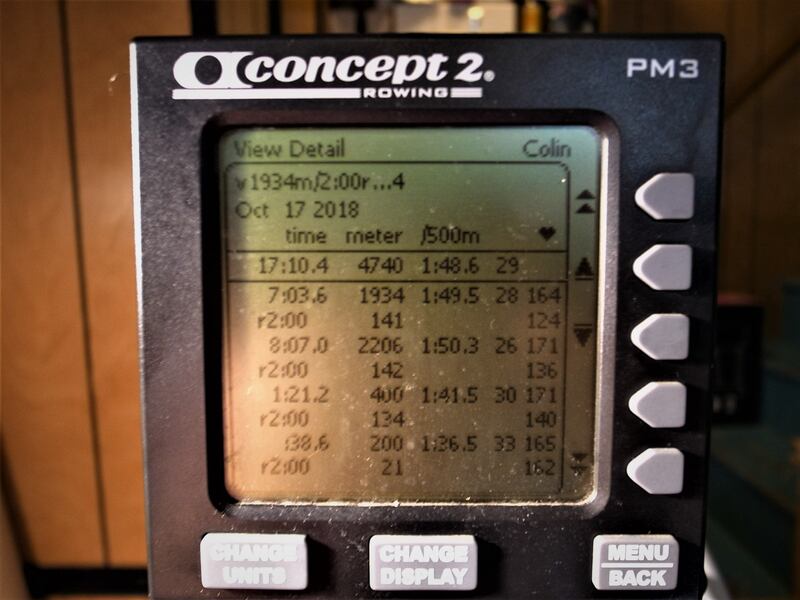 The closest I've come recently is one of my standard lunchtime workouts - 2 * 2k with 4:00 rest which I managed a 6:47.8 followed by a 6:46.7 at the end of Sept which is a significant PB for that workout. I think you're right - I have made an improvement this year though it's difficult to know what's made the difference. I suspect I might be close to 2k PB territory on the right day but I don't really want to waste several days training recovering so I''m not sure if I'll get one in soon. To be honest, setting a 1500m cruise at ~ 1:40/500 followed by a sprint finish just seems inconceivable, no matter if I'm in form or not ! Guy, Awesome times and looks like you could surprise yourself. Even without an all out effort it looks like you could hit sub 1.40. After the IRL yesterday wanted a marker fot the CTC as well. Still not in C2 shape as before, but today felt better then yesterday, even though I wasn't looking forward to this one. Perhaps there's room for improvement before the end of the month. At least I have entered a score now. First go at the October CTC, still getting back in shape after long hiatus ... (since roughly 2006-2007!) with a few attempts at getting back on the horse here and there. Well done Fred, those last 2 intervals are hugely impressive! Sorry for being a no-show - asthma has been playing up, so no exercise for a while. Hopefully be on top of it soon. Well done to all those taking part in support of such a worthy lady and important cause! Take care of yourself Jane. Much admiration for all the hard won results so far. Blatant favouritism I know but extra special thanks to our lovely ladies, they are . You are all a plucky bunch. If you go to the CTC page from the links at the top of this forum, towards the top right of that page is a link "add or update a person". Fill in your details there including your affiliation to Free Spirits and then add your time once you've found your name on the (ever growing) drop down list on the main CTC page.